Bottled water is bad. We know that, yet the marketing that has been done on Americans is effective. We believe tap is bad. I know better, yet when I travel and I have run out of my filtered home water, I will succumb to buying a crappy bottle of plastic water. I feel bad. I know better. I know it is toxic. I know it is awful for our earth. I know bottled water companies are hurting local communities. Yet, I still can’t just fill my [amazon_link id=”B0093IS19C” target=”_blank” ]Klean Kanteen[/amazon_link] in a bathroom sink. Hmmm. I KNOW BETTER! Our water isn’t the only thing unique about our product – our package is one of the most environmentally sensitive packages on the shelf. Composed of 74% paper, 76% less plastic than a traditional PET (plastic) bottle! Q? 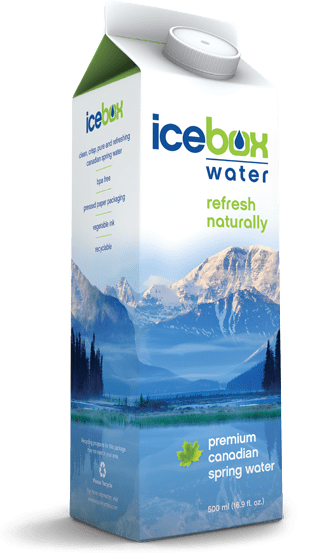 How long has Icebox been available? A. Icebox was originally introduced in 2008. In 2014 we located a perfect source in Canada which greatly reduced our carbon footprint as we are no longer shipping from Norway. In this same year we refreshed our packaging so it can sit aesthetically on your desk, in your briefcase, or lunch box, reflecting the beauty of Canada and the pristine source. In 2012, total U.S. bottled water consumption increased to 9.67 billion gallons, up from 9.1 billion gallons in 2011. In fact, 2012’s consumption growth was the strongest it has been in five years. In addition, per-capita consumption is up 5.3 percent in 2012, with every person in America drinking an average of 30.8 gallons of bottled water last year. Bottled water increased in absolute volume more than any other beverage category in the U.S. I am glad Americans are drinking more water, but bottled water is not the healthiest option for the planet or our bodies. Alternatives to plastic packaging are a step in the right direction for when you find yourself in need of bottled water. With careful planning, this should be a rare occurrence.